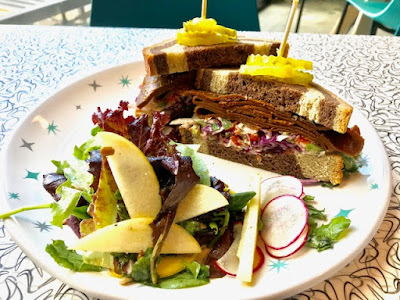 The long-awaited plant-based cafe at Crosstown Arts — where I work — is NOW OPEN! I can literally open my office door, walk about 30 steps, and find myself at the adorable retro teal green counter where one of our lovely cafe staff is waiting to take my order. We call it plant-based, but there are a couple vegetarian items (with eggs or cheese). I'd say 95 percent of the menu is vegan. Plus, there are daily pastries (generally always vegan! ), coffee drinks (with numerous plant milk options), and beer/wine. Just take a look at these pastries (all vegan!) and a fancy macchiato from our baristas. And a few inside-the-cafe shots. I'd say this is probably the greatest thing that's happened to me all year. And it's great for Memphis because our cafe is offering whole foods-based, scratch-made, mostly vegan meals in large portions with accessible prices. You really can't beat that. Full disclosure: As the communications coordinator at Crosstown Arts, it's my job to talk up the place. But I promise I'd be just as excited about this cafe if I didn't work here. The cafe is open for breakfast, lunch, and dinner, Tuesday-Friday from 8 am-7 pm, and on Saturdays, 10 am-4 pm for brunch (hours will be expanding soon). 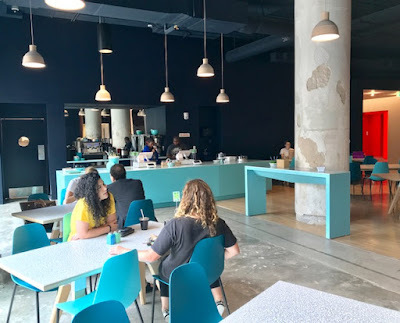 The cafe feeds both our resident artists (who come to Crosstown Arts from across the world) and the general public, making it a unique meeting space for artists to intersect with the greater Memphis community. Chef Raymond and his crew are putting out some amazing dishes! 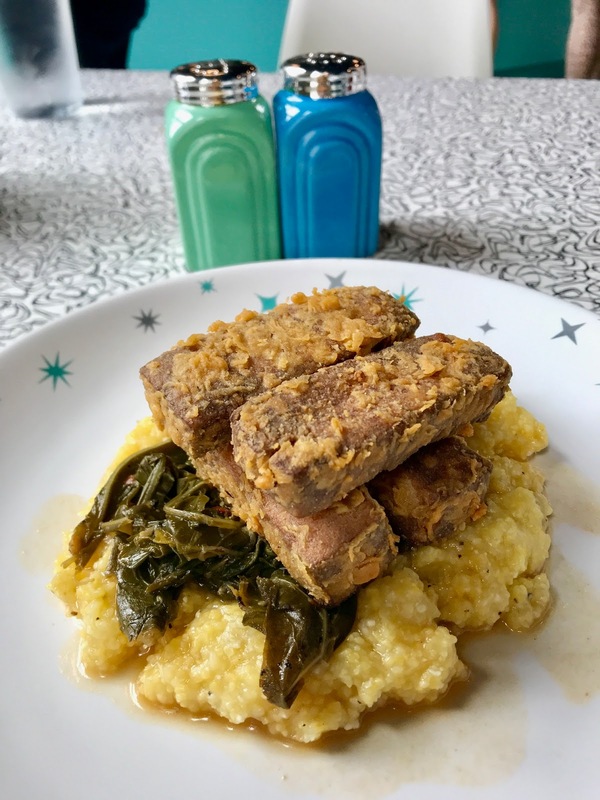 My very favorite thing is the Chicken Fried Tofu over grits and greens. Chef has actually changed the cut of the tofu in later versions of this dish to be triangle-shaped, but this is the only pic I have for now. I could eat this every day. 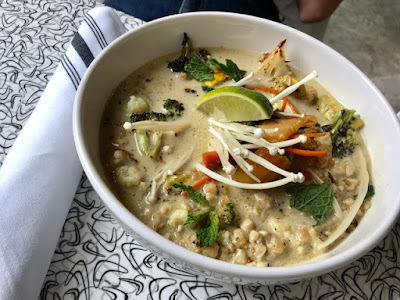 The Thai Green Curry Bowl has a citrusy-coconut milk base with brown rice, veggies, and chunks of tempeh. The enoki mushrooms on top really step it up! We have an in-house baker, Ali, who makes all of our breads and pastries, and she even bakes fresh buns for the Vegetable Burger (black beans/mushrooms/beets). Served here with crispy Home Fries. She also makes the marbled rye for the Seitan Pastrami Sandwich, which features Raymond's house-made seitan. It's thinly sliced and seasoned. So good you'd think this came from a vegan butcher shop! Served with Creole coleslaw and pickles. On the side, I had the Green Salad with baby greens, apple, radish, sunflower seeds, and the best-ever rice wine vinaigrette. The Curry Tofu Salad is my second fave menu item (after the chicken fried tofu). Here's an older pic when Raymond was testing it as a sandwich. It was delicious but messy, so it's now offered atop a salad. Either way, it's to die for — curry mayo, chunky baked tofu, grapes, onion, celery, and spices. I'm craving it just thinking about it. There's a Fried Chickpeas dish on the snacks menu that is absolutely addictive. These peas are fried with sage and seasoned with lemon and spices. I highly recommend grabbing an order to share with a friend! You can also order a smaller side dish of these with your sandwich. The pastries and coffee drinks are offered all day, so every morning, on my way into the office, I'm forced to walk past pastries like this, Vegan Cream Cheese Danish (which Alli made with cultured cashew cream!!). Some days, I'm able to fight the urge. Other days, I give in, but I try to at least split my goods with my vegan co-worker/food buddy Madelyn. It's also pretty amazing having a coffee bar right outside my office. They make the best oat milk lattes (soy and almond are also available, but oat is my fave!). I've not yet tried the breakfast menu, but it includes a vegan yogurt & granola bowl that I can't wait to try. And I've yet to stop in on a Saturday for brunch but soon. In addition to the regular menu items, the cafe also offers daily specials, so be sure to look out for those. We provide resources and create opportunities and experiences to inspire, support, and connect a diverse range of creative people, projects, and audiences. The spaces and programs we manage integrate varying components of exhibition, performance, production, education, and retail. We welcome anyone in the community to join any of our events or projects, regardless of prior experience or expertise with creative interests. Crosstown Arts Cafe is located in Crosstown Concourse, 1350 Concourse Ave., Suite 280. Check out the menu here. Oh. My. Gosh. You are the luckiest woman ever having that so close to you! I agree with Susan!! Lucky lucky gal!! The curry tofu salad souns AMAZING, I might need to try and make that myself! And the rye bread is gorgeous!! Yes!! It all looks so incredible! I have to agree with the above sentiments, you are so lucky to have this within a few steps! The pastries are beautiful, I need some of that in my life! The chicken fried tofu sounds so delicious as well! My gosh, i would seriously just stare at the menu dumbfounded and unable to make a decision...! Wow. They would see a lot of me for oat milk cafe au lait, and i’m a total sucker for fresh baked breads. Seriously awesome you work for such a vegan friendly building and company!